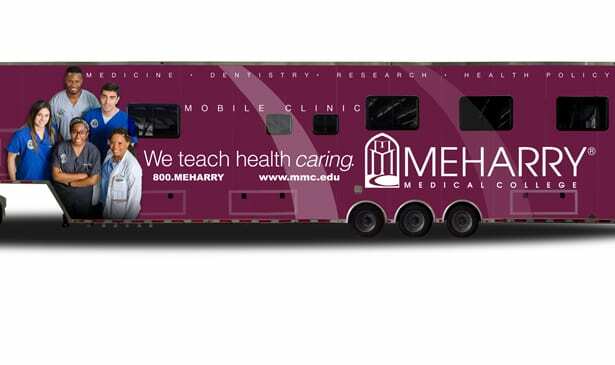 Artist’s conception of Meharry’s mobile dental clinic. The clinic contains four treatment bays and will allow School of Dentistry students more access to patients in remote areas of the state, but is a strong representation of Meharry’s commitment to serve the underserved. Approaching its sesquicentennial year, Nashville’s HBCU health sciences center has set its sights on achieving goals both at home and abroad. It is the prerequisite for a healthy existence. It is the predeterminate quality for a successful organism. It is the necessary ingredient for viability. 2017-18 was a good year for Meharry Medical College, and growth has been the watchword. The year has seen groundbreaking change, strong initiatives both domestically and internationally, sound development within its three schools of study, and substantial support from its benefactors, alumni and friends. It was a foundational year in achievement as Meharry presses forward toward its sesquicentennial in 2026—“Evolution and Transformation,” as Meharry’s President, Dr. James E.K. Hildreth, refers to it: the embracing of new developments and technologies for the equipping of graduates for the world they will face. Growth is central to that vision, coupled with momentum. 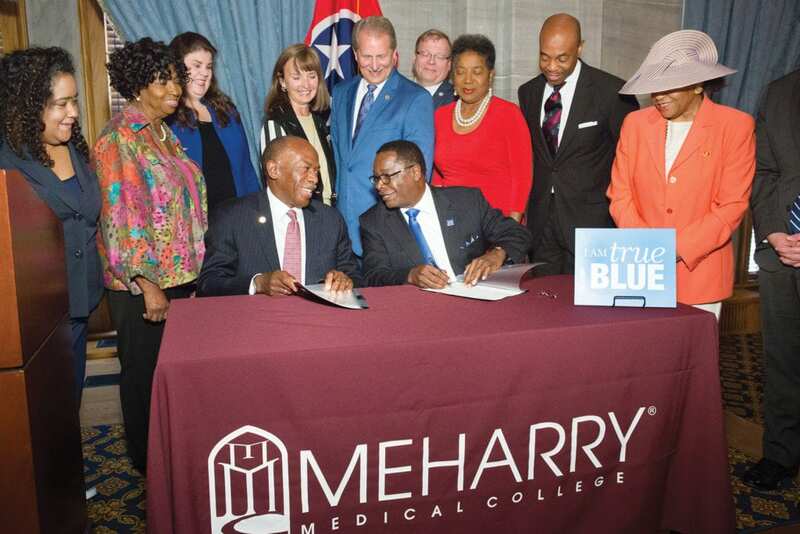 On June 22, 2017, officials from Meharry and Middle Tennessee State University met at the Tennessee State Capitol to sign an agreement that would develop an accelerated path for top students to graduate as physicians to practice in rural areas of Tennessee. The “three plus three” program is selective, and would allow a student to fast-track a bachelors-to-doctoral path with the intent to serve residency in rural areas of Tennessee. State officials and students watch Meharry president, Dr. James E.K. Hildreth, and Middle Tennessee State University president, Dr. Sidney A. McPhee, sign into effect a collaborative program for physicians designed to alleviate the shortage of doctors serving in rural Tennessee communities. Health in Tennessee is ranked among the worst in the country—among the bottom five for some health metrics. One reason is that there simply aren’t enough doctors to care for Tennessee’s citizens, particularly in rural counties. Meharry’s president, Dr. James E.K. Hildreth, proposed the accelerated program to state officials and State Sen. Bill Ketron, R-Murfreesboro (an MTSU graduate) and Mike Krause, Tennessee Higher Education Commission (THEC) executive director, collaborated to bring MTSU to the plan. Currently, the proposal, signed by MTSU President Sidney A. McPhee and Dr. Hildreth, would see high-ability students enroll in the program at MTSU in the fall 2018 semester to earn a bachelor’s degree in three years, and then begin at Meharry to attain a medical degree three years afterward. Students in the program would be eligible for financial aid from a state fund if they commit to working in underserved areas of Tennessee for an agreed-upon time. State officials have already committed to a $750,000 fund. The innovative program between a public university and private professional college is unique nationwide and being called a “wow moment” and a “game changer” by state officials. On November 9, 2017, HCA Healthcare, one of the nation’s leading providers of health care services, and Meharry Medical College, one of the nation’s largest historically black academic health science and research centers, announced that they have entered into a partnership in which the College’s students will train at Tri Star Southern Hills Medical Center. Under a Memorandum of Agreement, Meharry medical students will receive clinical training at HCA’s TriStar Southern Hills Medical Center in Nashville as the school’s index hospital. The agreement expands a decades-long relationship between the two Nashville institutions, allowing them to collaborate in new ways toward advancing care for the underserved, creating a diverse health care workforce and championing the elimination of health disparities in Nashville and around the world. The Meharry partnership enriches HCA’s ongoing growth in clinical education and helps its efforts to care for the underserved. Meharry’s deep expertise in treating diseases prevalent in underserved populations will complement HCA’s efforts to care for patients who face those health challenges. The partnership also increases HCA’s participation in graduate medical education (GME) throughout the country. With 203 residency programs to date, HCA continues to expand its GME offerings to help reduce the nation’s physician shortage. Training students in the HCA system also allows Meharry to bring students training remotely back to Nashville. For several years, Meharry has had to send students to hospitals out of state due to limited patient volume at Nashville General Hospital, the primary hospital where it has conducted its training. Through this partnership and HCA’s large in-patient endeavor, students will now be able to remain in Nashville. Student training with Tri Star Southern Hills Medical Center as Meharry’s index hospital is scheduled to begin this summer. Meharry has established a mobile dental practice anchored by a tractor-trailer outfitted as an oral treatment clinic. The mobile practice will take dental care to remote, rural and underserved parts of Tennessee. The facility contains four treatment bays within the 65-foot trailer, maintains its own generator and can operate independently where necessary. The mobile clinic began its mission in February 2018. The mobile clinic will also provide on-site dental services for youth in state custody at 16 facilities operated by Youth Villages and United Health Centers. Others working with the School of Dentistry on the mobile clinic include the Tennessee Health Coalition, the Tennessee Department of Health, DentaQuest, the Elgin Foundation and the United Methodist Church. The clinic will allow students from the Meharry School of Dentistry access to more patients to help refine skills in developing competencies necessary for graduation. The School of Medicine may also use space in the mobile clinic in the future to take physician care to underserved communities. 2017 saw impactful international overtures by Meharry Medical College, with collaborative health care strategies including the African Union and China. The African Union comprises 55 member states on the African continent working toward “a peaceful, prosperous and integrated Africa”—and coordinated health care is a major need. 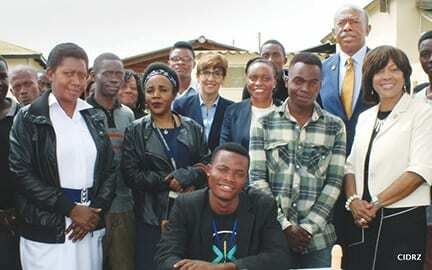 At Zambia’s Chainda South Clinic with Dr. Maria F. Lima, center; Dr. Hildreth, back row right; and Dr. Valerie Montgomery Rice, president and dean of Morehouse School of Medicine, far right. Officials from the University of Zambia visited Meharry in April, firming up new initiatives with Meharry and Morehouse. Meharry alumna Arikana Chihombori-Quao, M.D. ’86, the African Union’s Ambassador to the U.S., has been the chair of the African Union-African Diaspora Health Initiative (AU-ADHI), galvanizing African Diaspora health professionals in attending to the health care needs of the African continent. Her vision includes putting Meharry Medical College at the center of that effort, and blends with Dr. Hildreth’s desire for Meharry students to experience and be exposed to life in Africa and the vast humanitarian work to be accomplished there. With initial meetings early in 2017, discussions included utilizing Meharry students and alumni in primary care, OB-GYN, emergency medicine, surgery and HIV/AIDS, including extensive development of teleconferencing. After later discussions engaging the deans of Meharry’s three schools and ambassadors from the African nations of Lesotho, Niger, Senegal, Swaziland and Zambia, the needs to be addressed by physicians on the continent also included maternal, infant and child mortality; surgery; treatment of various cancers; non-communicable diseases; cardiovascular diseases and hypertension; diabetes; child nutrition and preventative care. Dental needs include emphasis on prevention, cleanings, extractions, treatment of cavities and oral cancer screening—each country has its own priority. The goal, said Meharry School of Medicine Dean Veronica T. Mallett, M.D., MMM, is to leave “a legacy of learning.” Not only is the need great for physicians and dentists now, but training within the African Union is crucial, from mid-level clinical staff through cultivation of physicians and dentists. America’s three other historically black college and university (HBCU) medical schools: Charles R. Drew University of Medicine and Science, Howard University College of Medicine and Morehouse School of Medicine are also involved in the effort. In April 2017, a delegation including Dr. Hildreth; Dr. Valerie Montgomery Rice, president and dean at Morehouse; Dr. Maria F. Lima, dean of Meharry’s School of Graduate Studies and Research and senior vice president for research and innovation; Meharry HIV investigator Dr. Donald J. Alcendor and others traveled to Senegal and Zambia to meet with health care leaders, government ministers and local communities to see facilities and conditions first-hand to learn about natural products that show promise in the fight against infectious agents including HIV/AIDS and Zika. The group met with officials from the University of Cheikh Anta Diop in Dakar, Senegal to initiate several memorandums of understanding for student and faculty exchanges, seminars and visits by faculty in the disciplines of public health and infectious disease. Another visit to Zambia’s Chainda South Clinic and Kamwala Health Centre Youth Friendly Rooms considered how Meharry and Morehouse can become involved in the (U.S.) President’s Emergency Plan For AIDS Relief (PEPFAR) and Centers for Disease Control (CDC)-supported programs to specifically address the HIV epidemic among adolescents. An agreement was announced in April 2018 between Meharry, Morehouse School of Medicine and the University of Zambia to form a collaboration creating an international exchange program with emphasis on disease research and prevention (see the story on page one). Collaboration continues toward the goal of raising the standard of health care in the African Union, including the development of pilot programs and resources, coordination with NGOs, work toward the establishment of a global institute and help from the World Bank—all with Meharry at the forefront. 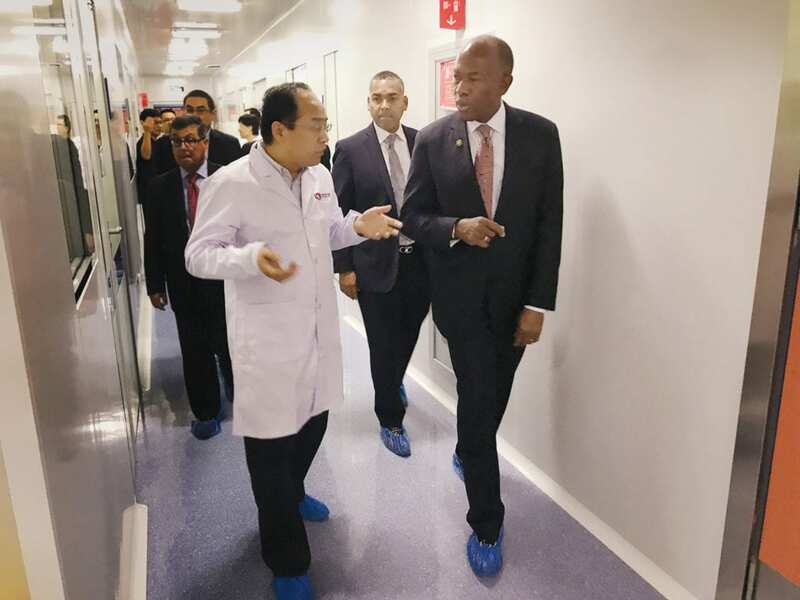 In October 2017, executives from Meharry including Dr. Hildreth and Patrick Johnson, senior vice president of institutional advancement, travelled to China to meet with officials from several hospitals and medical schools—including Tianjin Medical University, one of China’s largest—about collaboration in research, education and treatment. A day at Tianjin Medical University comprised tours of research facilities, cultural presentations and meetings with university leaders. For oral health, priorities are mostly different among the Chinese public from western culture, with regular, preventive dental care being the purview of the better educated or more affluent. Economically, many of the country’s citizenry will prioritize other needs over dental health. The result is a higher need for dental services in China, creating an underserved element—and an opportunity for Meharry to practice its mission to the underserved. 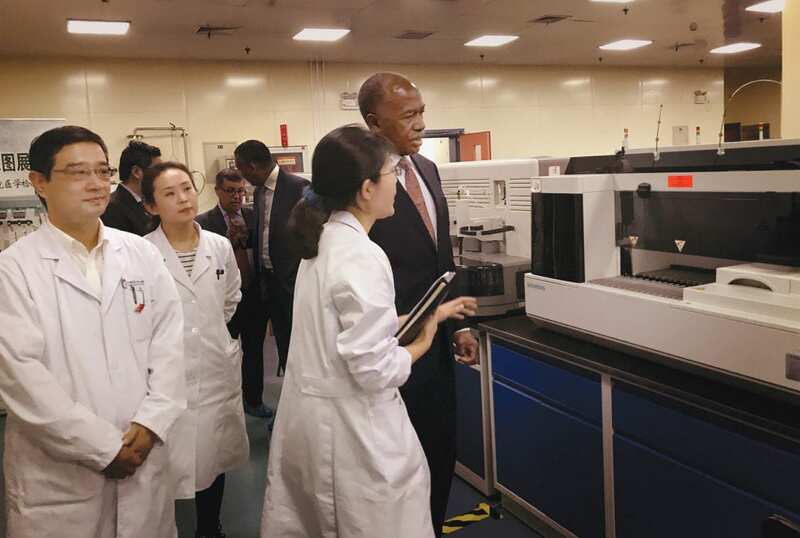 The Meharrians met with administration from many institutions including Shanghai Oral Health, Shanghai Yongci Hospital and Tianjin Medical University, exploring partnerships affecting students from both Meharry and their respective concerns. Those efforts would develop educational exchanges among the institutions and include Meharry’s School of Medicine and School of Dentistry. The arrangement would also allow for greater cross-cultural access with unique educational opportunities for Meharrians and an opening for Meharry to practice its mission of “service to mankind” in a new part of the world. Next articleWhat Does Each Mayoral Candidate Bring to the Table?